Sitting quite comfortably in the San Francisco airport awaiting my flight. After a lovely dinner at Avanti with Nicole last night I slept not a wink. Anticipation…..Breakfast early at Kelly’s with Diana and Nicole..last minute goodbyes to some dear friends….and here I sit ,three hours prior to departure…Curiosity floods my senses. My heart is prepared for this adventure. I plan to share my moments with you, my joys, fears and realizations. I imagine it will be a journey of self exploration which I have truly been on for the entirety of my existence.I love this journey of life. And I think sometimes we need to leave in order to come back…..We need to leave that which makes us comfortable to truly experience what this LIFE thing is all about. 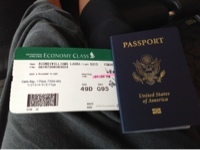 Off to wander…stretch my legs prepare for boarding in an hour or so….until Seoul…. I wonder if you're in Seoul, Sweet Soul. I am thinking about you so much!